Walt Disney wanted all ages to enjoy his theme parks. In a welcome new spin on Disney’s laudable efforts to make themepark vacations available to everyone, of every ability, of every culture, of every age, Walt Disney World in Orlando is rolling out new value lodging and lift ticket packages that honor the multigenerational traveler. Having just returned from the TMS Family Travel Summit in Phoenix where multigen was the featured topic, we know this market represents at least 37% of all leisure travel by American families, and it’s growing. At the May 1st press conference on Multigenerational Travel scheduled as part of the Mine Train Coaster opening in New Fantasyland, Holly Harrington and other Disney brand representatives said that they define “multigenerational” as any group of family and friends who chose to travel and enjoy the many Disney parks together. “The new Dumbo ride and now Seven Dwarfs Mine Train will allow grandparents to introduce grandchildren to the rides they knew during the golden age of characters,” she noted. “Families want to build bonds and this type of trip – what we call a grand adventure – will encourage them to do that together.” According to a WDW spokesperson, they’ve seen more and more multi-generational travel to Disney World over the past several years. 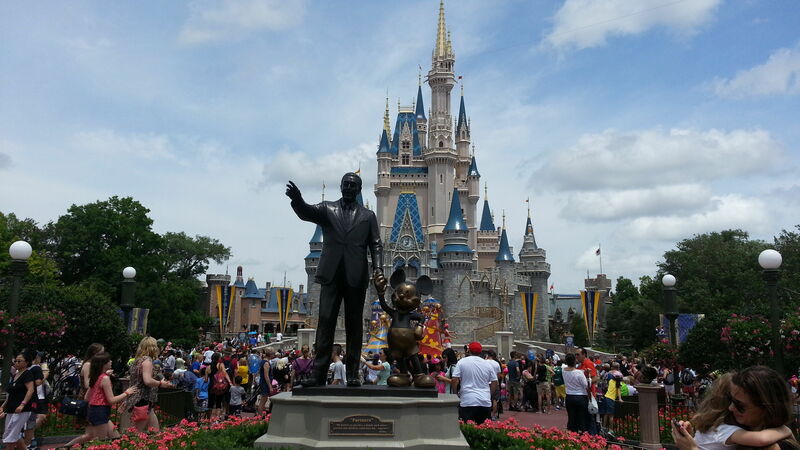 As of 2013, approximately 40% of US domestic traveling parties visiting WDW are multiple households traveling together. To facilitate the larger family groups, Walt Disney World is offering a Special Ticket Offer for parties of 6 people or more who buy a minimum four-day Magic Your Way (multi park pass) by June 14, 2014, to receive a 5th day free. It’s valid for all ages and all passholders in the group. Grandparents will love the rollicking gentle rolls of Mine Train and the sweetness of Dumbo, as well as the other toddler-and-grand-friendly new attractions that have made New Fantasyland a treat for multigenerational groups. Using the new Magic Bands and the My Disney Experience Plus tools to prebook timed access to preferred rides – after all, grandparents hate waiting in line almost as much as tiny travelers – makes it easy for larger groups to plan events together, or to go their age-appropriate ways and meet up for meal times or the gentler rides at pre-organized times. The app and mobile site have maps that feature nearby snack stands, air-conditioned shows and restroom areas where family members can find shade and a place to sit and rest, as well. Fortunately for the digitally challenged, helpful cast members with iPads and electronic kiosks are stationed throughout the parks to assist visitors with this new technology, designed to make the park visit less challenging. Another great perk is the Grand Adventure Lodging Special, which grants families 30% off WDW on-site hotels with a 5-night stay, and 35% off a 6N stay, a huge savings during the busy summer season. With so many hotels at so many price points to choose from, this is a boon for travelers on any budget. Note that the newest properties like the Art of Animation Resort already boast family suites sleeping at least 5 people, and all the other resorts have connecting rooms available. The newest Grand Floridian Villas at that posh Magic Kingdom resort are one-, two- and three-bedroom affairs with full kitchens, making it possible to fit everyone from every generation into close yet luxurious quarters. This Grand Adventure hotel special has to be booked by June 6th and is valid for stays on most nights between June 15-August 28, 2014, and may possibly last longer. Plus, their agents can help you save even more when you upgrade to a Magic Your Way room and ticket package with minimum 6-day tickets. Theme park tickets are valid for one theme park per day and must be used within 14 days of first use. All tickets and options are non-transferable and non-refundable, are only valid during regularly scheduled operating hours and exclude activities/events priced separately. To book, please visit DisneyWorld.com/Together or call 844/2Gether and purchase in advance, as these offers are not available to walk-up visitors.